Even with still nearly nine months to go in 2019, boxing fans have already given up hope of seeing any combination of Deontay Wilder, Tyson Fury and Anthony Joshua facing one another this year. With that comes the next steps in their respective careers and the hope for the best of the rest to at least fall in line. All three unbeaten heavyweights fight within a four-week span from mid-May through mid-June, each taking bouts perfectly staggered two weeks apart. Wilder (40-0-1, 39KOs) faces mandatory challenger Dominic Breazeale (20-1, 18KOs) on May 18 at Barclays Center in Brooklyn, New York. Two weeks later, Joshua makes his United States debut as he faces Brooklyn’s Jarrell Miller at New York City’s famed Madison Square Garden. From there, Fury will play Las Vegas for the first time in his career as he faces Germany’s Tom Schwarz on June 15 at MGM Grand. In the future lies little in the way of any type of matchup that could justify their waiting until 2020 for at least one fight between the three. To date, all that has come of their rivalry was a showdown between Wilder and Fury last December—which ended in a draw, and with plans for the rematch ultimately leading to the current rift. Despite the recent stumbling blocks, the fact that one fight has so far surfaced leaves hope for more to come. One such alternative who is currently left out in the cold for now is Dillian Whyte. The top-rated contender from England by way of Jamaica has been vocal about getting a fight with all three but allowed at least one opportunity to slip through the cracks. He turned down previous offers for a rematch with Joshua, holding out for a deal that didn’t so greatly benefit the unbeaten titlist, whom stopped Whyte in the 7th round of their Dec. ’15 clash. Whyte (25-1, 18KOs)—who turns 31 on Thursday—has won nine straight since then, including several bouts sanctioned by the World Boxing Council (WBC) whose title Wilder has held since Jan. ’15. Given the road he’s traveled, it’s understandable why he believes he’s been deliberately snubbed and also why he’s struggled to return to the ring since a thrilling 11th round knockout of Dereck Chisora in their rematch last December. For now, tentative plans call for the resurgent heavyweight to fight on July 13, with opponents being sought for a planned Sky Box Office Pay-Per-View event in England. By then, the only three heavyweights who presently rank ahead of him will have finished their fights, and hopefully with one of them next facing Whyte later this year. “I’m open to anything,” Wilder insists. “This is what boxing is all about. It’s a strange business… you may have a game plan going forward but you get something that interferes. You get things thrown in that mess up the plans. 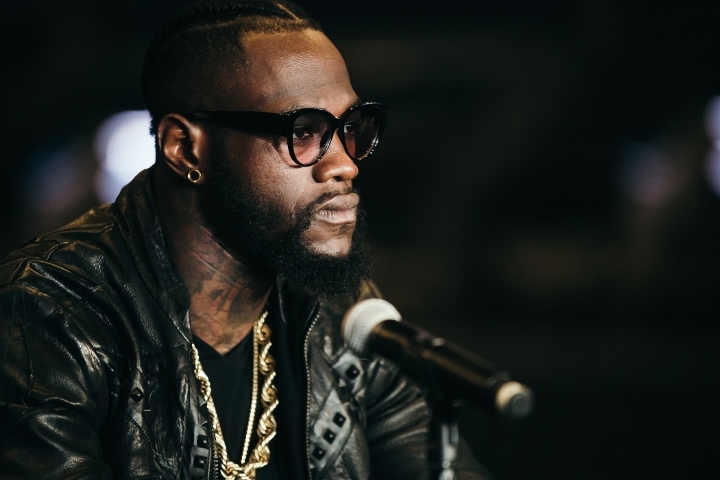 Wilder’s fight with Breazeale—which will air live on Showtime—will serve as the ninth defense of the title he’s held for more than four years. A win on May 18 will place him tied for fourth all-time for most consecutive successful heavyweight title defenses.